From the pulpy pages of Black Mask Magazine in the 1920s and 30s, through the film noir era of the 1940s, to today, noir fiction has lured many a reader and movie-goer away from the light and into the dark underbelly of society. Names such as Raymond Chandler, Dashiell Hammett, and James M. Cain; titles like The Big Sleep, The Maltese Falcon, The Postman Always Rings Twice� these have inhabited our collective consciousness for decades. Humanity, it seems, loves the dark. And within the dark, one figure stands out: that of the femme fatale. 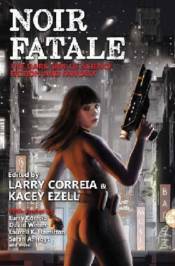 Here then, Noir Fatale an anthology containing the full spectrum of noir fiction, each incorporating the compelling femme fatale character archetype. From straightforward hardboiled detective story to dark urban fantasy to the dirty secrets of futuristic science fiction�all with a hard, gritty feel. As Raymond Chandler said, �Down these mean streets, a man must walk who is not himself mean, who is neither tarnished nor afraid.� Because, as these stories prove, doing the right thing doesn�t necessarily mean you get the big bucks or the girl. But you do the right thing anyway.